An inflammation or you can say a swelling accompanied by pain and infection of the appendix gland of the body is called Appendicitis. Appendix is a small finger-like 3.5 inch tube attached to the beginning of the large intestine. If not treated well in time, the appendix can rupture. It is considered medical emergency because a ruptured appendix can lead to potentially serious life-threatening complications like blood poisoning. Men seem to be more prone to develop Appendicitis as compared to women. The disease can be treated by removing the appendix itself through surgery. In the initial stages when the infection and inflammation do not spread throughout the abdomen then the inflammation causing Appendicitis might heal by itself also. 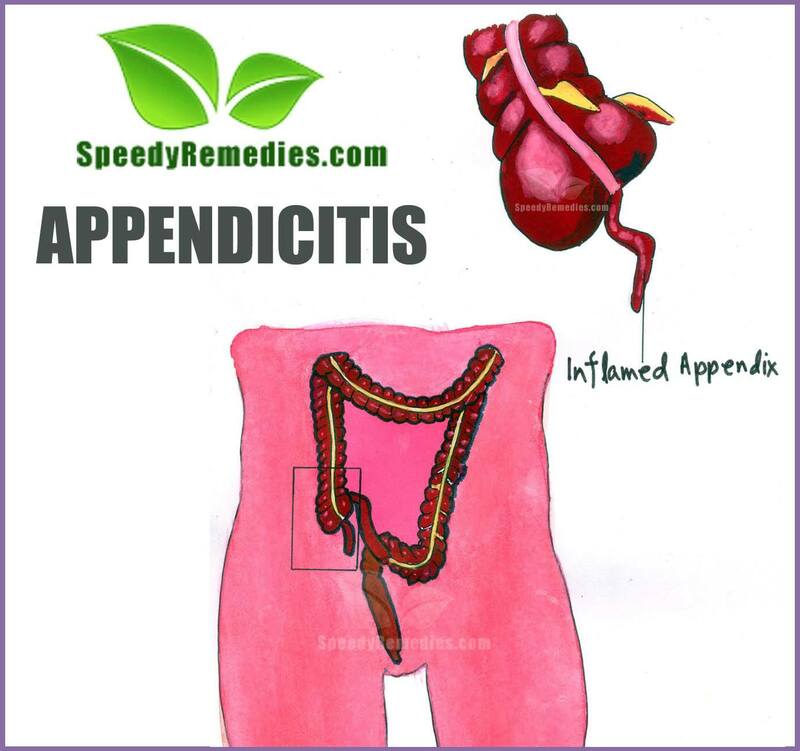 Natural home remedies for Appendicitis are helpful in subduing the unbearable pains and curing the disease internally as much as possible. Use of laxatives and pain killers should be avoided as they tend to hide the symptoms leaving the cause of the pain untreated. The most common causes of Appendicitis are infection (such as gastrointestinal viral infection) and blockage in the appendix. The cause of blockage could be a hard piece of stool, a foreign body or a cancerous growth that might have got trapped in the appendix. Inflammatory Bowel Disease, Crohn’s Disease and Ulcerative Colitis may also cause blockage in the appendix. The pain experienced in Appendicitis can be described as a shifting pain which starts around the navel (belly button) and gradually to the lower right abdomen where the apex is situated. The pain becomes very severe an almost unbearable with the passage of time, especially after 24 hours. The pain gets worse with sudden movements like coughing, sneezing etc. The most common symptoms include loss of appetite, diarrhea, constipation, inability to pass gas, abdominal swelling or tenderness and vomiting. But the intensity with which these symptoms manifest themselves varies with people. In some cases, the patients tend to suffer from low grade fever and chills as well. • Drinking one liter of buttermilk with a pinch of salt on a daily basis is one of the easiest possible home remedies for Appendicitis. • Consuming whole wheat including wheat bran and wheat germ is an effective natural cure for the disease. • Tea brewed along with fenugreek seeds is a tried and tested home remedy for the disease. • Drinking 300 ml carrot juice mixed with 100 ml beetroot juice and the same amount of cucumber juice, two times a day acts as an effective cure for Appendicitis. • Agrimony and Dandelion are simple and equally effective natural home remedies for Appendicitis. Drink Agrimony tea every two or three hours to cure the disease and take two to eight grams of dandelion herb on a regular basis. However, people on blood thinning medicines, blood pressure related medicines and those who suffer from diabetes, kidney diseases or gall bladder diseases are advised not to take these herbs and opt for other home remedies. • Taking one tablespoon of an infusion prepared from green gram thrice a day is one of the most popular natural home remedies for Appendicitis treatment. • A Decoction of prepared from Holy Basil is a beneficial natural remedy for fever caused by the disease. • Ginger and turmeric with their therapeutic properties are efficient home remdies for Appendicitis related vomiting. • Taking Gotu Kola herb two times a day on a regular basis is an effective Chinese home remedy for healing this disease. • Drinking one glass hot water mixed with two to three drops of mint essence is a source of immense relief when it comes to Appendicitis. • Hot compresses can be used to reduce the pain. Several studies have shown a correlation between a high fiber diet and low incidence of Appendicitis. Green vegetables, especially beans, cabbage, Brussels sprouts, cauliflowers and peas are rich sources of dietary fiber. Processed tomatoes and fresh fruits are also beneficial in this regard. Many essential nutrients are present in the skins of various fruits and vegetables. Therefore, one should try to retain the skin of such fruits and vegetables while consuming them. One should try to include vegetable juices like spinach juice, coriander juice, carrot juice, radish juice and spinach juice etc in the regular diet to help prevent as well as cure the disease. Seeds and nuts should be consumed in optimum quantities to derive maximum benefits. One should try to avoid constipation as it tends to worsen the situation. For this, one should drink plenty of water.